Or so I tell myself. Because while fear can be a powerful motivator, it can also be the opposite, rendering us virtually paralyzed. That’s why this image is such a great message. 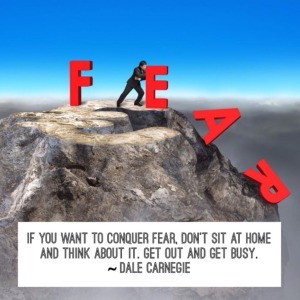 Just how does one go about conquering fear? There are many books and articles about doing just that. Here are some simple steps you can take, courtesy of Tess Marshall, who guest-blogged at Goodlife Zen. 1. Don’t believe your negative thoughts- Train you mind to think positive and learn to expect the best. 2. Let go of the outcome- Remain open to the possibilities. 3. Create a space for gratitude- Remember all your past successes, your strengths and determination. 4. Be comfortable with the uncomfortable- Learn to get through the things you fear. Have you ever walked through a fear and come out on the other side? I have and the exhilaration, empowerment and freedom I felt was like nothing else! The next time I set out to face a fear, I remembered what I had done before, and walking through it was easier. Give it a try. You’ll be glad you did.